Gennaro Gattuso heaped praise on Jack Wilshere as AC Milan prepare to face Arsenal in London. AC MILAN HEAD coach Gennaro Gattuso revealed he is a keen admirer of Arsenal midfielder Jack Wilshere ahead of Thursday’s Europa League showdown. 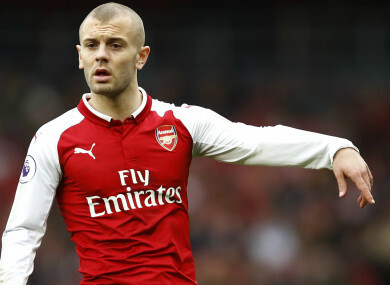 Wilshere is out of contract at the end of the season and the Englishman is no closer to extending his time at the Emirates Stadium, with Arsenal manager Arsene Wenger revealing there has been no progress in negotiations. The 26-year-old – who emerged from Arsenal’s youth ranks in 2008 – has been linked with various clubs, including Milan and Serie A champions Juventus. Talking about Wilshere prior to the second leg of the Europa League last-16 tie, Gattuso said: “I remember him when I came here to play a tournament in 2011. He can play in any league. “He isn’t particularly fast, but does have good technique. He can make the ball do the running and knows where to put it. He can play both as a support striker and playmaker. Milan face an uphill battle to reach the quarter-finals following their 2-0 loss at home to Arsenal last week. Goals from Henrikh Mkhitaryan and Aaron Ramsey saw Arsenal to a comfortable victory in Milan but while acknowledging the task at hand, Gattuso insisted his team have nothing to lose. “We know that we have to do much better than the first leg, but we are proud to play in a beautiful stadium against a great team. We are a little tired, but we have to give it a go,” said Gattuso, who will be without Davide Calabria and Ignazio Abate for the London fixture. “We were born ready. We know it’s difficult, I’d be a hypocrite to say otherwise. In football and sport in general, the best thing is beating the odds. We didn’t come here for a day trip and we didn’t underestimate Arsenal at San Siro, they simply played better than we did. Tomorrow we hope it’ll be different. “I am not someone who gives the team big speeches before a game. I already stress them out shouting at them for 90 minutes during a match, I can’t start talking even when they ought to relax. Email “Milan boss Gattuso likes Wilshere 'a lot' amid Serie A links”. Feedback on “Milan boss Gattuso likes Wilshere 'a lot' amid Serie A links”.